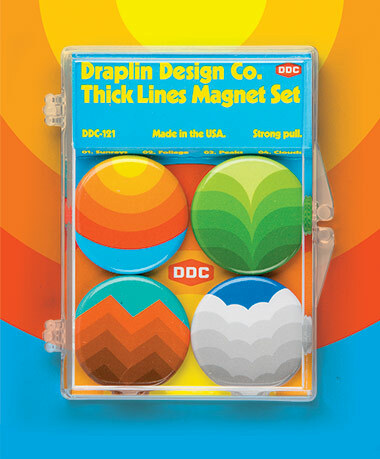 Draplin Design Co.: DDC-121 "Thick Lines Magnet Set"
Riding on the success of our Thick Lines poster series, we made a magnet set with our Sunrays, Foliage, Peaks and Clouds designs. Each button is 1.25” in diameter, and man, these magnets have some serious pull to them. Will hold down just about anything. Seriously. 01. The thickest of lines! 02. 1.25” diameter magnet buttons. 03. Great for that fridge, or, hell, any metal surface. 04. Offset printed for vibrant color. 05. Handy plastic carrying case. 06. Proudly manufactured in Portland by the good people of Badge Bomb. Thanks, bombers! 07. Each set is lovingly inspected by Badge Bomb’s Kurt Frederiksen.